I stood there in joy, trembling with excitement, while tears formed in my eyes. 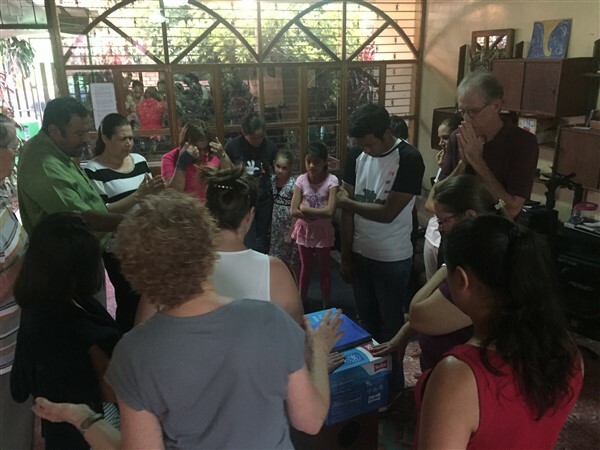 Gathered around a cardboard box with a blue lid that once held reams of paper, a local church was dedicating 30 copies of the Gateways Dunamis manual in Spanish. That group of people, plus intercessors from our own networks, had prayed long and hard for this moment–and now it was real. 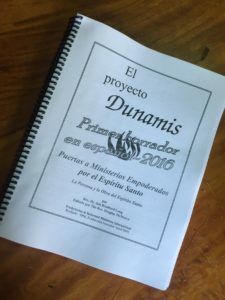 The last few months of translating the approximately 88,000 words of the manual–plus the full set of Gateways slides–was being set apart for the Gateways Dunamis in Matagalpa, Nicaragua. The local Nicaraguan leadership team, who have been praying for this event for the last few months, have also helped to pray this reality in. A milestone towards the Spanish Mobile Dunamis has arrived. Gateways to Empowered Ministry is the first unit in the Dunamis Track. In this first unit, participants are introduced to the person and work of the Holy Spirit and discover what it means to be filled with the Spirit for empowered ministry. 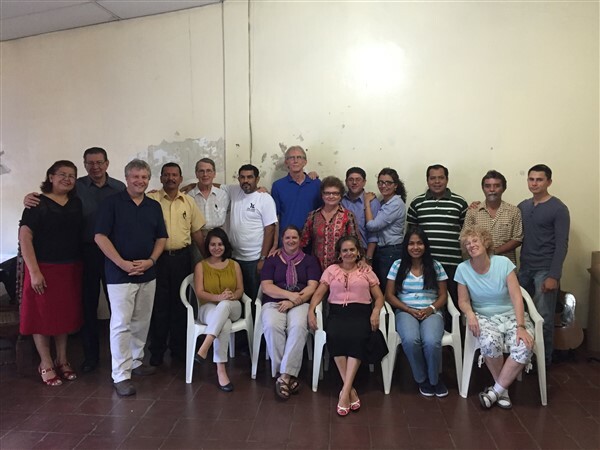 In the retreat in Matagalpa, pastors and church leaders gathered to deepen their relationship with the Lord and grow in their knowledge and experience of the Holy Spirit. We were not in a quiet retreat center but in a house on a busy city street, yet the group connected with the Dunamis principleÂ of withdraw and return and used the time as their retreat. They cultivated a sense of fellowship and security that started the roots of a new Dunamis community. It was a week of refuge, as our intercessors prayed into those themes of community and retreat. We also saw how the Lord carried us through several logistical and back office challenges so that we could still focus on the event. We saw how the Lord kept us healthy so we could function in ministry. We saw how participants met with the Lord during this event. As teachers of this Dunamis Gateways, we have the joy and privilege of hearing different testimonies–more than can be put down on paper or uploaded on a website. One new pastor serves a really humble community “out in the middle of nowhere” as his first church. He has been through Growing the Church last fall and now the Gateways Dunamis. He received prayer for the fresh infilling of the Spirit so that he could serve a community where he was sent. One pastor on the leadership team really came to understand the distinction between “upon” and “within,” a core concept in the entire Dunamis framework. This helps him in his ministry in understanding the episodic nature of the Holy Spirit’s empowerment. Another pastor, who has studied abroad in France and is now pursuing a master’s degree in church history, enjoyed the section that explores the different Greek verbs used in scripture for “filled.” He drunk it in. This was high value for him and gives Dunamis academic credibility and validity. He and his wife are excited about the upcoming Dunamis Project 2. A teenage girl who attended received prayer toward the end of the event. 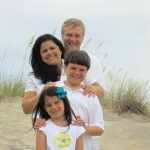 She was able to connect with Jesus and discern a call to missions. You need to come. You’ll deepen your relationship with the Lord and have a deeper knowledge of the Holy Spirit. Another woman received some prayer ministry and her life was touched. I experienced a fresh infilling of the Holy Spirit in my life. God brought me here to experience this refreshment. I’ve been empowered for ministry. The “upon” and “within” helps explain a lot of the questions that I’ve had based out of my experiences. These are but a few of the possible testimonies to share. This group has begun to own the vision of the Spanish Mobile Dunamis. They are the pioneers who experienced Gateways in Spanish. They experienced the draft versions of the manuals and slides. However, they have begun to dream of the global impact that this teaching will have once the material in Spanish is on jump drives and in videos. This group is providing the leadership needed not only to have a complete Spanish Dunamis track here, but to produce the manuals and slides that will impact a larger world. The sacrificial offering of their time and work will be multiplied hundred-foldÂ to see that vision advanced. Pray for the editing team and the translation team as they work on taking care of these fixes in the manual and slides. Pray for provision for the next manual. Pray for the fellowship to form deep ties to grow the Dunamis community in Nicaragua. Pray that the Lord would seal all of the work that has been done this week and would cover and protect everyone from any backlash from the enemy. Give praise and thanks for the pioneer work which has been done here and pray that this would only be the beginning of what the Lord has in store. I also want to thank those of you who financially give to support work like this in Nicaragua, Guatemala, Panama, Bolivia, and other countries where we serve.